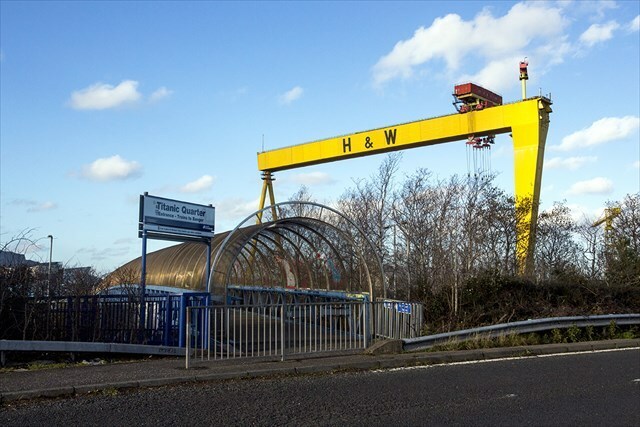 This should be a quick and easy find adjacent to Titanic Quarter Station on the Belfast to Bangor railway line. Obviously, the best way to visit this cache is to come by train! Hopefully, there will some who will chose this means of getting to the cache location. But, if you chose to travel by car, please use the recommended parking area nearby and walk the short distance to the cache site (see ‘Additional Waypoints’ below), as it is NOT SAFE to park on the roadway beside the cache. THE CACHE is a camouflaged screw-top container held in place by magnets. It ONLY contains a log roll, so please remember to bring your own pen or pencil to sign. You may also need tweezers to extract the log. As with all our caches – the rule here is – ‘No sign, no find’! Stealth may be required if there are people about, or when cars are driving past the cache site. When replacing the cache, please take care to put it back EXACTLY where you found it. If in doubt, re-read the hint. Thanks. for their ‘Joint-FTF’ on this cache! Ybbx sbe gur 'qbjauvyy-bar' bs gjb frgf bs ‘N-Gevnatyr-bs-Obyg-Urnqf’, gura srry haqrearngu.